My job at Capital Ideas here at the Edmonton Journal is wonderful, but occasionally a tad void of photo and video journalism. That being said, occasionally I get pulled in to help out with the newsroom. A couple months ago, colleague and amazing photojournalist Ryan Jackson tapped me to come shoot video for a project (without telling me what it was until we arrived). 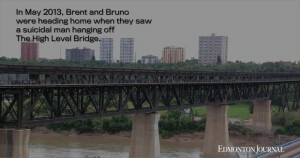 Turns out it was for a feature story on the history of suicide off Edmonton’s High Level Bridge. I played a very small part in putting this together but the team that worked on it did such an amazing job on both the story and the video that I needed to share it. It’s, sadly, a story that isn’t told often enough but one that’s very important to hear.